We can't give you a quote from Filip Bona Man & Van Services, but we have hundreds of drivers waiting to offer you a great price. Have a question for Filip Bona Man & Van Services? No problem, send them a message and they'll email you back as soon as possible. If you have a more general question you might find it answered in the FAQ, or you always contact one of our brilliant customer service team. * Filip Bona Man & Van Services won't be able to see your email address. Good honest hardworking driver with reliable clean van, always delivering a 5 star service. Please review and book my service. The guys were very helpful, strong and hard workers. 100 % reccommend them. Very professional, helpful and respectful. Would strongly recommend. Great friendly people and worked really fast taking care with my stuff. They also waited for me to finish off packing, as I was also late and they were really helpful - I would recommend them to anyone. Great service! 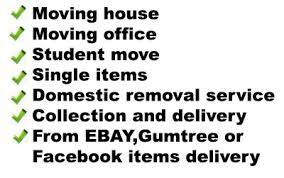 The couple who came for our moving were very much decent and did the whole work within an hour. Also were absolutely punctual. We really appreciated their support. Thank you very much and we will definitely recommend you to our friends. arrived early, loaded our gear carefully, pleasant company on the drive to Peterborough, speedily unloaded our gear up two flights of stairs to our new flat. great service. Very good service and courteous, Van was clean and tidy and he strapped the cabinet down very well. Absolutely faultless service from Filip Bona by far the best I have had in London. Cannot recommend them high enough.